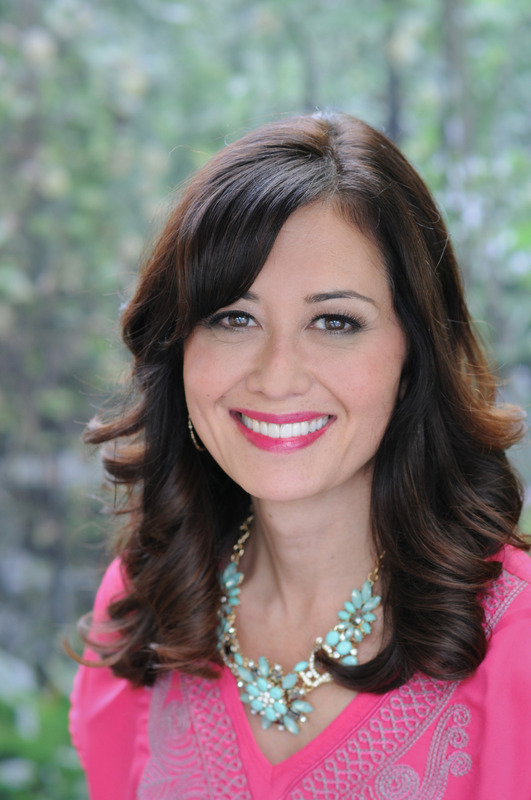 Hello… I hope everyone had a great weekend! I want to share a REALLY easy project with you. 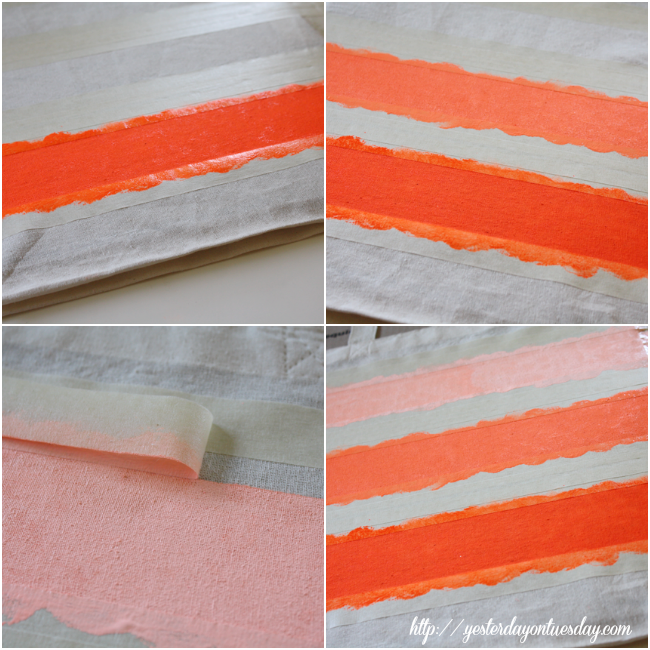 I used neon orange textile paint but any fabric paint would work. 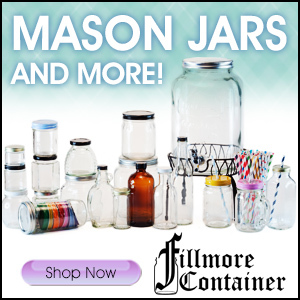 This is pretty inexpensive and it’s another great reminder that sometimes the simplest supplies work the best! 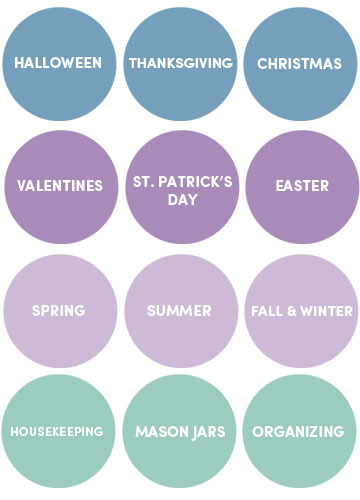 This is also a project that the kids could make and get great results from! 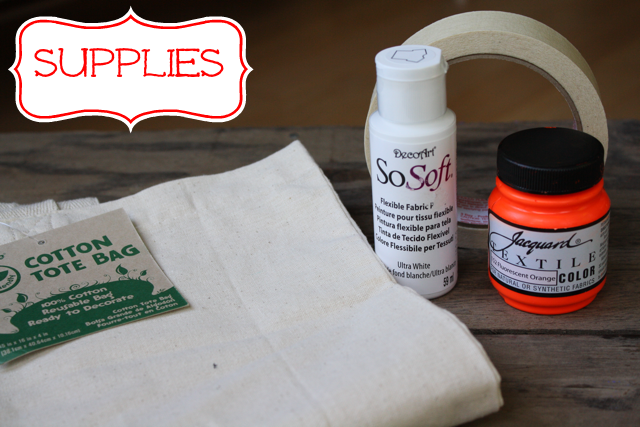 Supplies: Cotton Tote Bag (this one is around $3), DecoArt SoSoft Fabric Paint (this is my fave white fabric paint), Jacquard Textile Paint in Fluorescent Orange, a spouncer or foam brush and plain old masking tape. You’ll also want cardboard to put inside. Also, if you have a yardstick or tape measure, that can be really helpful too. You’ll also need 3 paper plates for mixing paint. 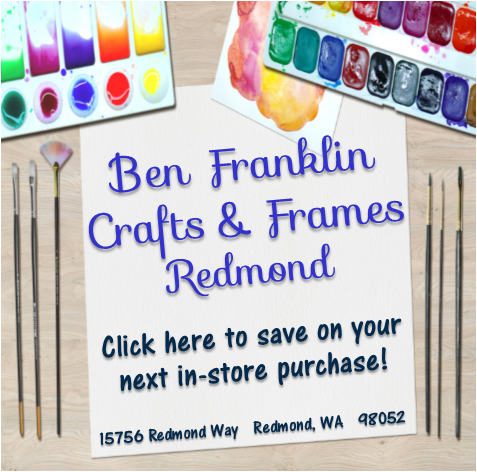 My craft supplies came from Ben Franklin Crafts and Frame. Love them! Step 1: Put the cardboard inside the bag to prevent the paint from coming through. Step 2: Measure where you want to place your stripes. My stripes were each 2″ thick with 3″ of blank space between them. I used the masking tape to actually tape the bag to my workspace– I went past the edges of the bag. This keeps the bag stable while you’re working on it. 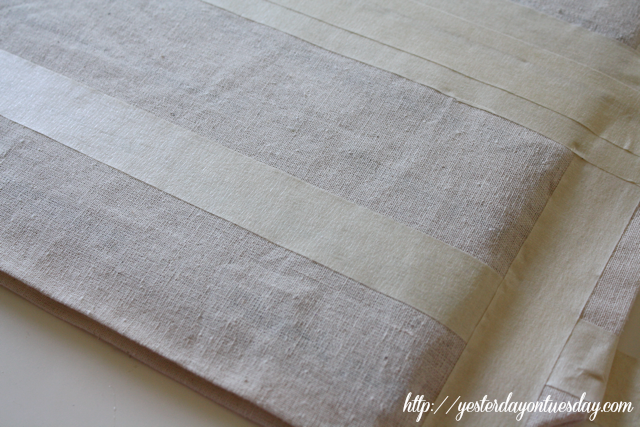 Step 3: Paint the bottom stripe with your paint color… don’t add any while fabric paint. Let it dry and add a second coat. Step 4: On a separate plate, mix the orange paint with some white paint. Make enough to do at least two coats. If you are worries about it drying out on the plate between coats, you can put a piece of plastic wrap on top. Paint two coats, allowing drying time between applications. Step 5: On the last plate, mix your color with lots of white paint until you get desired shade. Repeat Step #4. Step 6: When paint is completely dry (I would let it set overnight), gently remove the masking tape. Enjoy your new tote bag! Great tutorial, Malia! I love those ombre stripes! you always make your crafts look so ‘do-able’! this is going on my to-do list! Love the colors my dear! You always make everything come to life!! 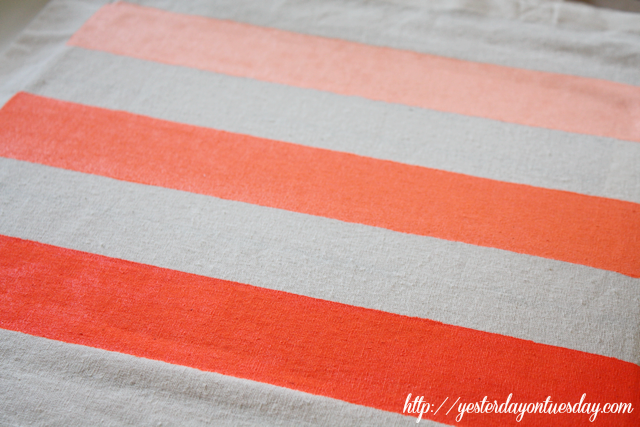 I love ombre stripes!! THe neon color is awesome!! Love this!! Thanks for the tutorial!! I heart this so much! 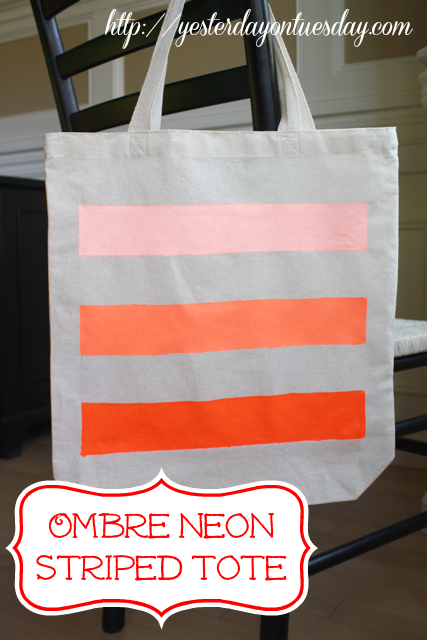 I love the look of ombre anything, and a girl can never have too many totes! Thanks for sharing the instructions. I’m all over this! 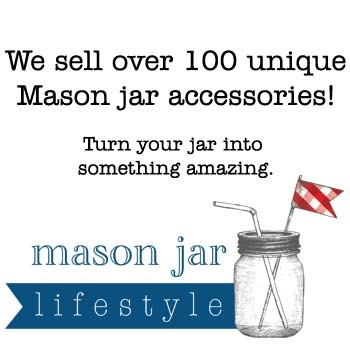 Stopping by from Hoyby Crafts, yor newest follower! I love the color combination on this tote bag, Malia ~awesome! Very cute! I love that colour, very summery! This is so cute Malia! I think it would be a great school or gym bag! I love everything about this bag! I’m featuring it tomorrow on Sew Woodsy–thanks for linking up! Wowza! That is some bright paint! I love how simple you have kept this project. Its perfect for the neon! I just love this bag! So simple, but so stinking adorable. 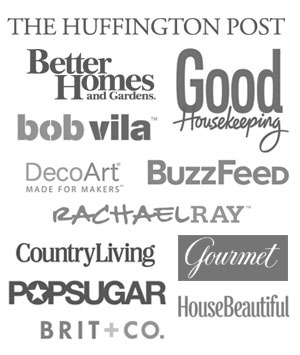 Thank you for sharing it with us at the Life Inspired Link party and congrats on being featured. Simple, chic and elegant! I love it, Malia!